Today is the birthday party for a dear friend with a rather warped sense of humor. 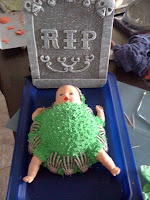 I couldn't decide between a zombie baby or a cat litter cake, so I made both for tonight's party at the Saucer. Zombie Baby cake was inspired from the time Josh etched RIP into a cake at work because e thought it was a tombstone cake, come to find out it was a cradle cake for a baby shower at his office. The cake is a blood red inside with gummy worms that will fall out when he cuts into it. 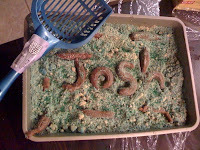 Cat litter cake is an old Halloween standby of mine. It's german chocolate with chocolate frosting covered in crushed white oreos colored green and blue like cat litter. The cat turds are made from large tootsie rolls with pinched ends and it's a delicious creation that most people never taste because they can't get over what it looks like. It's served in a new cat litter box with a new cat litter scoop. I promise both were washed and sterilized and it's completely edible and delicious :) I will say this is the first time I have ever spelt out someone's name in fake poop.